Until well into the 20th Century, Kesgrave was just a quiet little village off the road between London and Yarmouth. At the 1851 census, when rural populations in East Anglia were reaching their peak, it was home to just 86 people. 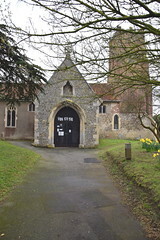 The tiny church of All Saints was perfectly large enough to serve such a population, and although it underwent a considerable restoration there was no need to enlarge it. Today, more than ten thousand people live in Kesgrave, and the Borough of Ipswich has reached out to engulf it. You leave the centre of town on Woodbridge Road, which quickly becomes Ipswich's longest, dullest, straightest road. After about four miles it changes its name to Main Street as it enters Kesgrave, and continues its relentless passage eastwards with busy traffic roundabouts and underpasses. Two lovely moments punctuate this mundanity, both churches, and the first of them is All Saints. Something happened here in 1980 that we will come to in a moment. Suffice to say that this must have been a very small church indeed before then, and the grand north porch must have quite overwhelmed it. 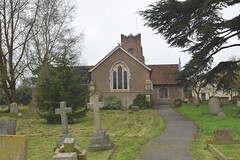 The late medieval redbrick tower is one of several similar in this area, and again appears overgrand for the little nave. The buttressing is curious, as though the tower and nave had to be joined together at some point. 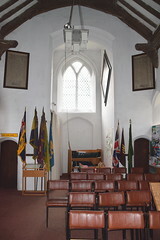 You step through the porch, which is as high and almost as long as the church, into the north side of the former nave. 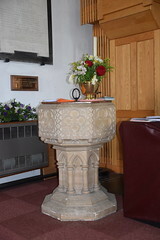 Inside the door sits the 19th Century font, removed here recently from its former awkward space towards the tower. 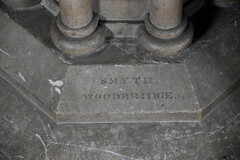 Unusually, it is signed by the workshop that made it, Smyth, Woodbridge. The former chancel to your left is screened off to create a space for private prayer, known as the St Francis chapel. 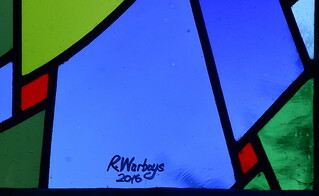 I have to say that it used to feel a rather gloomy space, but in 2016 it received the great blessing of a gorgeous east window by the Mellis-based artist Rowland Warboys. The only 19th Century glass is a lancet depicting The Light of the World in a south side window. Turning back west you can see how small this church once was, the nave leading back to the small tower arch and the cramped space beneath. However, all of this is barely noticable, for walking back out of the chancel and turning left you enter one of the most splendid modern liturgical spaces in Suffolk. It is large and square, more than twice as big as the church against which it is built. 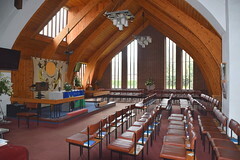 It completely alters the internal dynamic in an unexpected way, and moves the focus of the church quite away from the former chancel. 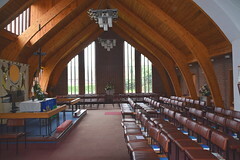 Wooden archbraces stretch from east to west, almost in the manner of an upturned boat, and the chairs focus on an altar placed centrally against the east wall of the extension. The whole piece is imaginative and articulate. 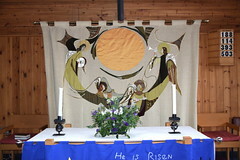 It would have been easy, for instance, to simply place the new altar against the south wall, in the manner of a traditional church. 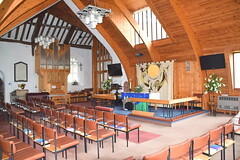 However, here it is both unified with the former chancel, and surrounded by open space in the modern liturgical manner. The architect was Derek Woodley, from Felixstowe. He is not well-known, but his work here deserves praise and recognition. 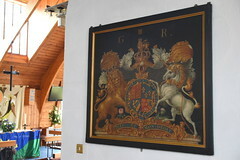 He was also responsible for the fine entrance area at Kirton, and the restrained restoration of Iken after the dreadful fire. 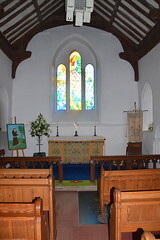 The furnishings, the needlework reredos, the glass and wood are all exquisitely done. The extension dates from 1980, but even if it had not been required by the rapidly expanding population, major work was necessary to prevent the collapse of the former south wall. 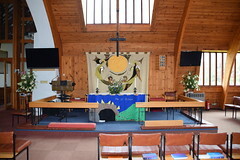 The cross beams from the extension are, in fact, holding up the old church. 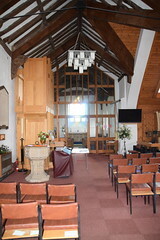 To the west of the new extension are church offices, and, that blessing in a medieval parish church, lavatories. On the west wall in a case are a pair of medieval sheep-shearing scissors, found when the extension was built, a reminder that Kesgrave has not always been underpasses and supermarkets. At the time of the 1851 census, a second census was taken of 'Religious Worship', which is to say a counting of heads in every church, chapel and meeting house in the land. The counting was the responsibility of the minister in each case. Anglican church ministers frequently made excuses for the size of their congregations that morning, most often blaming their thinness on adverse weather. Curiously, the weather did not seem to have the same effect on non-conformist congregations. 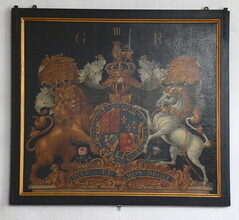 At Kesgrave, however, the situation was quite different. There was no non-conformist chapel, and, indeed, not many dissenters, as perpetual curate William Ewing noted. 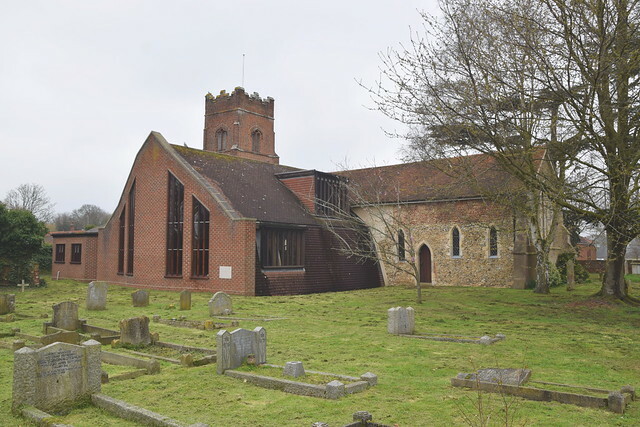 Ewing lived at Albion Hill, back at the Ipswich town centre end of Woodbridge Road, and his journey out here each Sunday morning seems to have been worthwhile, for the congregation of 79 that morning was almost the entire population of the parish. 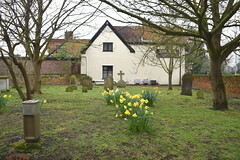 Consequently, Kesgrave had a higher proportion of its people at morning service than any other parish in Suffolk. And All Saints still feels a busy, successful building, home to a cheerful, evangelical community. I expect that the extension and reorientation give a few other parishes pause for thought.